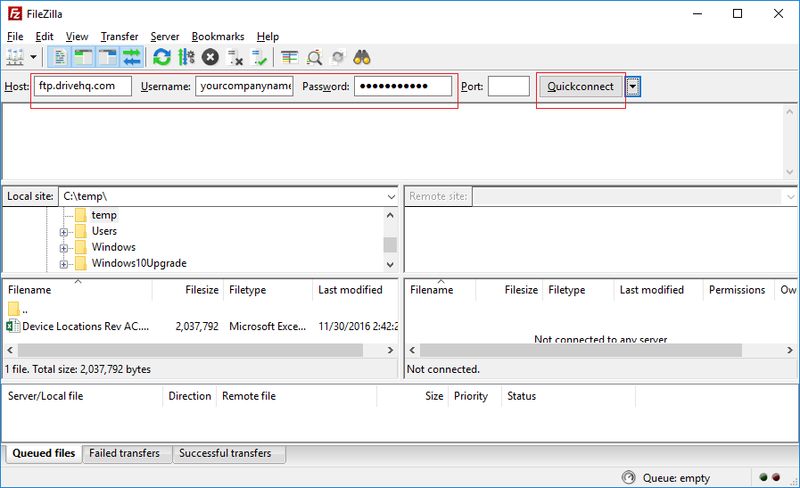 FileZilla is one of the most popular FTP client programs. It is free and open-source. FTP is the most popular way of transferring large files over the Internet. FTP stands for File Transfer Protocol. The original FTP protocol is a plain-text protocol without any data encryption. It is not suitable for transferring confidential information. However, related protocols such as FTPS (FTP over SSL) and SFTP (SSH FTP) are both secure. DriveHQ is one of the largest FTP Server Hosting service providers. 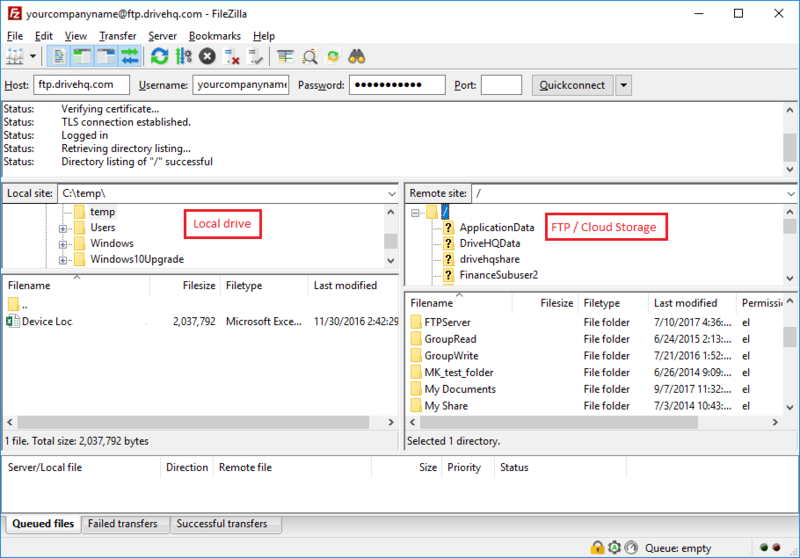 In this document, we will talk about how to configure FileZilla with DriveHQ's FTP Server Hosting service. The information is also useful in configuring other FTP client applications. -	Visit www.DriveHQ.com website to sign up for a free account. The free account does not expire, but it has some restrictions, e.g. limited storage space and download bytes, limited number of logons per day and a maximum of 2 concurrent connections, etc. Free service users cannot use SFTP, which is a paid service. However, they can use FTPS (FTP over SSL). It is as secure as SFTP. 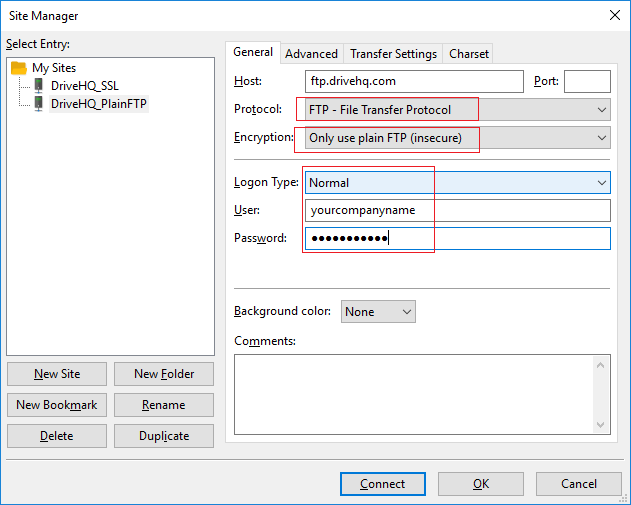 If you only need to log on to DriveHQ FTP server once, and if you only need to use the default FTP options, then this method is recommended. Port Leave it empty. The default port works fine. On the left-hand side, it displays your local folders; on the right-hand side, it displays the FTP / cloud folders. You can easily drag and drop files / folders between the left and right panes. If you are a regular DriveHQ user, usually you will see a folder named “DriveHQShare” in your root folder. This is a special virtual folder. You cannot modify or delete it. If another user shared a folder to you, the username will appear in the “DriveHQShare” virtual folder. 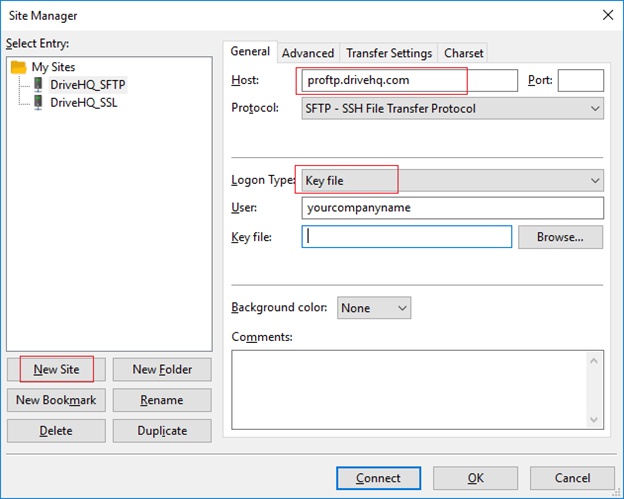 If you will log on to DriveHQ FTP server multiple times, or if you need to access advanced FTP options, then this is the recommended method. It will open the Site Manager dialog. Click OK to save the FTP site info, or click Connect to save the site info and then connect to the FTP site. 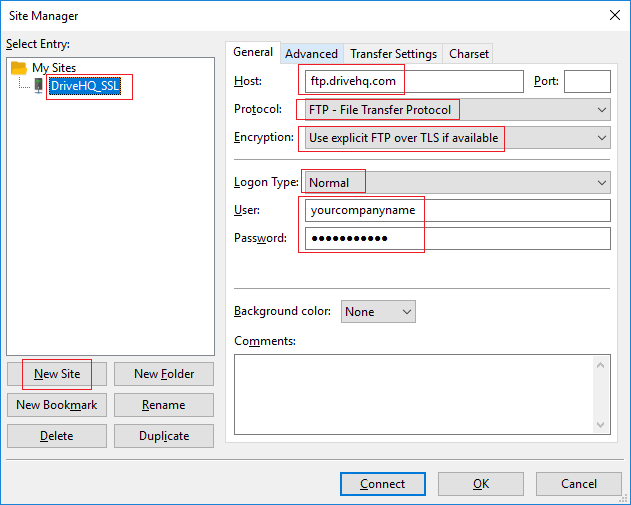 In Site Manager, you can create an FTP site using the plain FTP protocol. The plain FTP protocol does not encrypt data for transmission; moreover, it sends username and password in clear text format. Normally, you don’t want to use the plain FTP protocol. 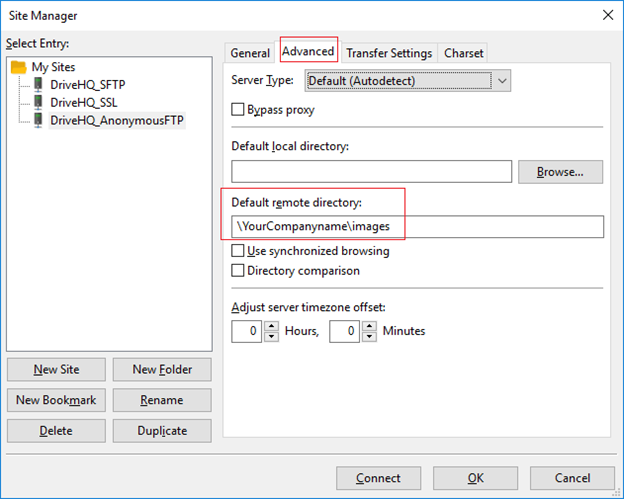 But FileZilla can be very helpful in trouble shooting FTP connection issues, esp. if you turn on the FTP Logging feature. That’s it. Click Ok to save the FTP site, or click Connect to save and connect. 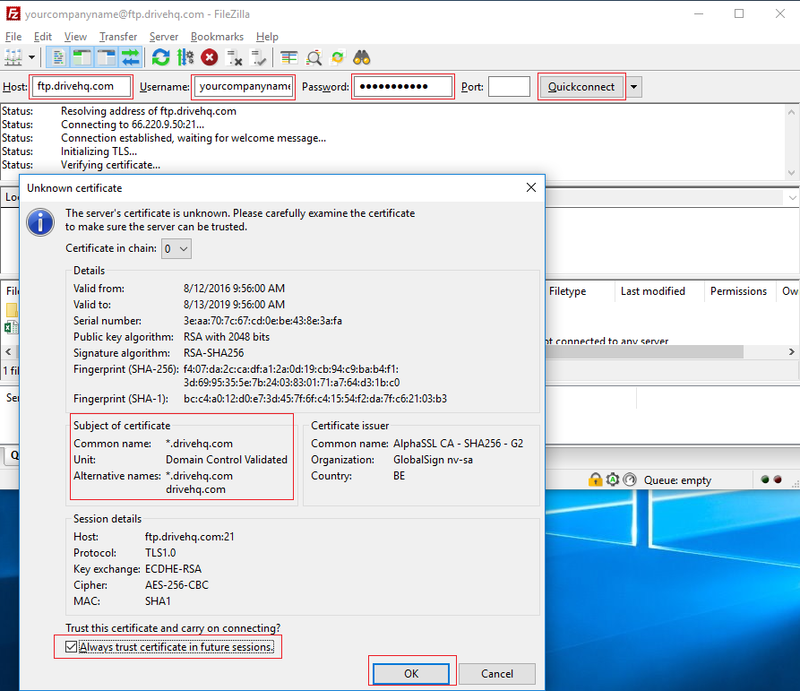 You will not see any certificate dialog with a plain FTP connection. SFTP is often thought as “Secure FTP”. In fact, it means SSH FTP (SSH means “Secure Shell”.) “Secure FTP” is really FTPS (FTP over SSL), which uses the same FTP protocol, but adds SSL/TLS encryption. SFTP is more secure than FTP, but it is a very different file transfer protocol. SFTP is better than FTP or FTPS in that it is more firewall friendly. It uses only one TCP port 22. While FTP/FTPS is less firewall friendly as it has two connections (channels): Command channel and data channel. FTP/FTPS requires opening a large range of TCP ports on either the client side or the server side. Port Leave it empty. The default port 22 works fine. Click OK to save the FTP site info, or click Connect to save and connect. Click OK to continue connecting to the SFTP server. A typical username & password is sometimes considered less secure, esp. if the password is not strong enough. SFTP supports key file based authentication (Public key authentication). While key file based authentication is probably more secure, it is more difficult as you need to assign a key file to each user. Due to the complexity and management overhead, there is a separate charge for key file based authentication, please contact DriveHQ support for more details. A key file needs to be generated online and you need to download the private key. You can then click the Browse button and select the key file. Please contact DriveHQ support for more details. Anonymous FTP does not require an account on DriveHQ. 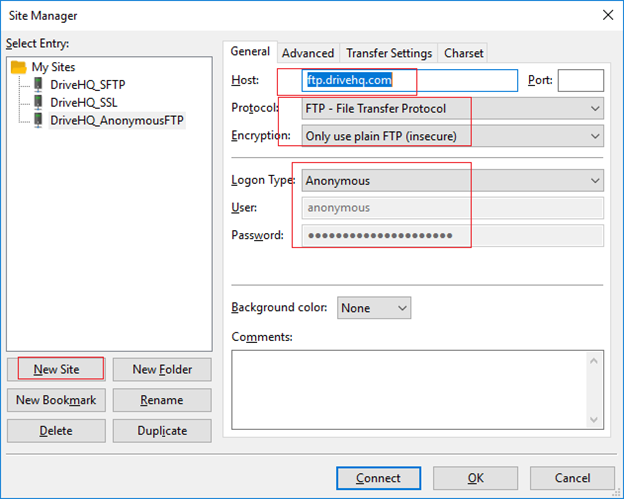 Anybody can connect to DriveHQ FTP Server anonymously. DriveHQ allows companies to host their virtual FTP servers on DriveHQ’s FTP site. Our anonymous FTP server is slightly different from other regular FTP servers on Linux or Windows. To enable other users to log on anonymously to access a folder in your account, first of all, you need to publish the folder. Only a Paid member or a True member (users registered with a custom domain company email address) can publish folders. Encryption: "Use explicit FTP over TLS if available" or "Only use plain FTP". Here YOUR_USERNAME is the user who published a folder (e.g. your username if you published a folder), PUBLISH_NAME is the name you used when publishing a folder. By default, it is the same as the folder name. But you can use a different publish name when publishing a folder. 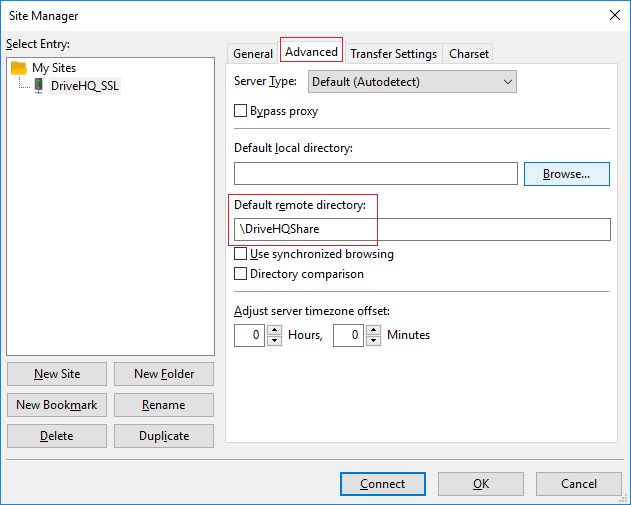 Click OK to save, or click Connect to save and connect to the FTP server anonymously. If you need to download many files/folders anonymously, it is very efficient to do so with FileZilla as you can drag and drop many files / folders reliably. DriveHQ FTP Server Hosting service is seamlessly integrated with DriveHQ's Cloud IT Service. If you need to replace a local FTP server instead of just an FTP account, then you need to use DriveHQ's Group Account service. The group account service is free with 1 sub-user license. You can order more user licenses for only $6/user/year. For more info, please visit DriveHQ's Group Account feature page. With the group account service, you can create sub-accounts for your employees and external clients. Different users can log on your FTP site with different usernames & passwords. Each user can be restricted to his/her own storage space, or a folder specifically shared to him/her. To share a folder, you just need to right click on a cloud folder on DriveHQ.com website, or DriveHQ FileManager client software. You can share folders to different users, subgroups and contact groups with various permissions. To access a folder shared to you, you just need to log on to your own account, then visit the special virtual folder "DriveHQShare". Inside the virtual folder, you can find a list of usernames who shared folders to you. Click on a username, you will see the list of folders shared to you by the user. When a user logs on to the FTP site, the initial folder is the user's root folder by default. If you allocate some storage space to all sub-users, then it probably is the correct home folder for your users. Many companies do not allocate storage space to sub-users. Instead, they store all data in the group owner's account. 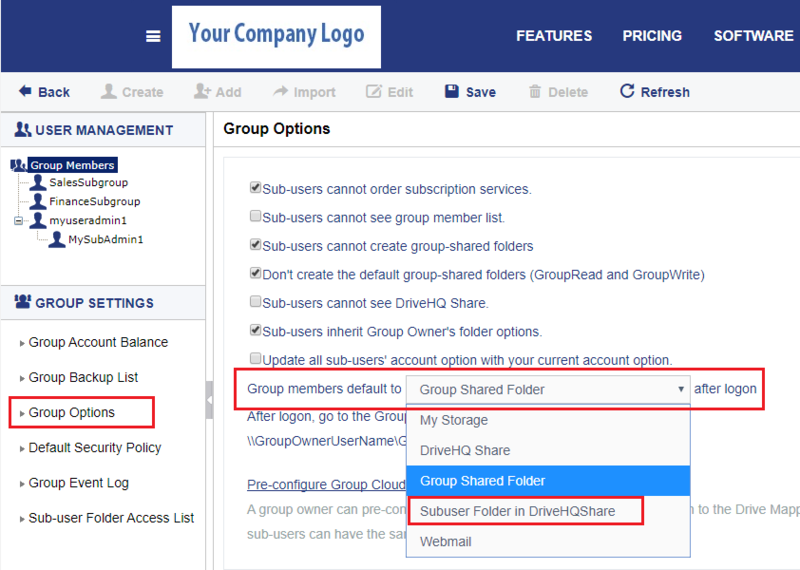 The group owner can create folders and share them to sub-users, subgroups or the entire group. In this case, you might want to change the default folder to a folder shared to the sub-user by the group owner. There are two ways to do that. One is to configure it in your local FTP client, e.g. FileZilla. You can enter any (valid) remote directory / folder path, incl. a shared folder. In the "Group members default to" drop-down list, select "Subuser folder in DriveHQShare". Click Save to apply the option. The system will automatically create a shared folder for each sub-user in the Group account. You might see a lot of new folders in the root folder (each folder is named with a sub-user name). You can move the folders to a different location if you like (but don't delete and re-create them). Many users use our FTP service for custom applications and devices (e.g. Dreamweaver, Uniform Solutions, Voice Logging software, FTP-enabled Scanners, DVRs and IP cameras, etc.). If there is a connection problem, you cannot easily see the error message. 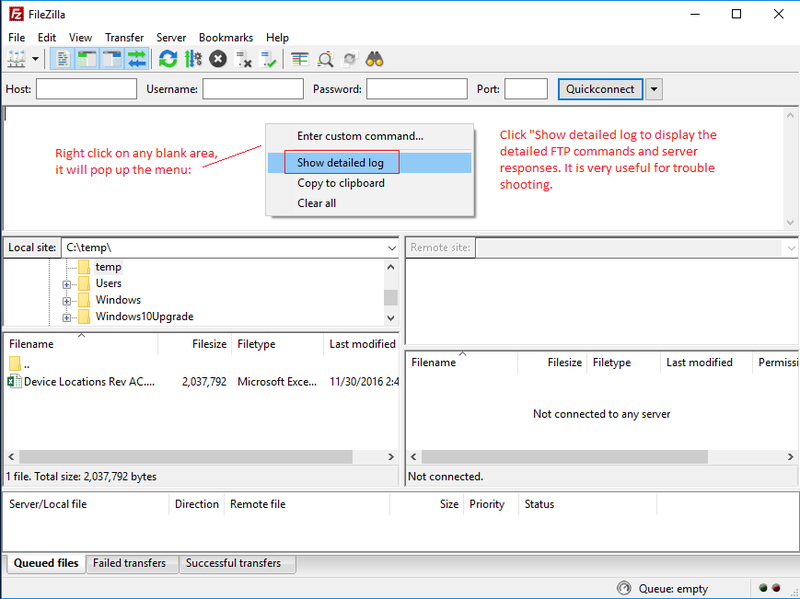 You can use FileZilla to help trouble-shoot the FTP connection problem. Click “Show detailed log” to display the detailed FTP commands and server responses. It is very useful for trouble shooting.